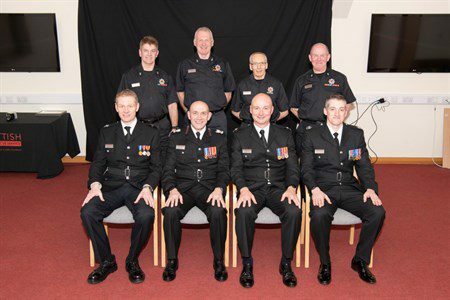 A group of experienced firefighters and Scottish Fire and Rescue Service colleagues with a combined service of 775 years have been recognised at a special award ceremony. The 90-strong gathering, including family members, was brought together at the Dumfries Training campus at Garroch Loaning, where they received Long Service Good Conduct medals and a host of special recognition certificates. The medals and certificates were presented by SFRS Chief Officer Martin Blunden, Deputy Assistant Chief Officer Peter Heath, and Local Senior Officer for Dumfries and Galloway Hamish McGhie, to acknowledge their incredible commitment to communities. The firefighters and staff members are based across the wider Dumfries and Galloway region, from Gretna to Stranraer. LSO McGhie said: “It was a real privilege to lead this fantastic ceremony in recognition of some of our incredible and highly committed staff and firefighters. “This was a formal opportunity to recognise and reward examples of long service, as well as outstanding individual and station contributions in Dumfries and Galloway. “But quite simply – this is about communities protecting communities, and I am in awe of these individuals. “There is absolutely no doubt that every single one has earned this recognition – for their outstanding and exemplary conduct over the past number of decades, and for their long and exemplary commitment to the service and their communities. “Each and every one of them are the epitome of the Scottish Fire and Rescue spirit. They have devoted themselves to keeping people safe. The firefighters receiving certificates for 40 years’ service were: Watch Manager Kenneth Simmons (Annan), William McLachlan (Kirkcudbright), John McGaw (New Galloway), Ronnie Stokes (Stranraer). The firefighters certificates for 30 years’ service included: Crew Manager Steven McKie (Gatehouse), Watch Manager Barbara Johnstone (Fire Safety, Dumfries), Frank Johnstone (Annan), Tony Anson (Lockerbie), Graham Blythman (Kirkcudbright), Watch Manager John Irving (Lockerbie), Stuart Wales (Stranraer), Watch Manager Roy McClymont (Newton Stewart), Watch Manager Robert McCrorie (Stranraer), Watch Manager James Hawthorn (Whithorn). The firefighters who received their Long Service and Good Conduct for 20 years’ service medals were: Crew Manager Gary Huxtable (Whithorn), Crew Manager Forsyth Galloway (Whithorn), James McGhie (Stranraer), Paul Rae (Lockerbie), Stuart Maxwell (Annan), Scott Hill (Dumfries), Watch Manager John Caughey (Dumfries), Stephen Thomson (Dumfries), Andrew Webster (Dumfries), Barry Grieve (Dumfries), Watch Manager Andrew Wilson (Fire Safety, Dumfries), Crew Manager Andrew Smith (Castle Douglas), Crew Manager Colin Murray (Dalbeattie), Graham McLachlan (Kirkcudbright), Murray Walker (New Galloway), Crew Manager Michael Lawrie (New Galloway), Samuel Fergusson (New Galloway, retired). Firefighter Paul Rae, of Lockerbie Community Fire Station, also received an award following his role in the ‘Cycle to Syracuse’ memorial event, in which firefighter Paul and four friends cycled more than 600 miles to Syracuse University in New York, in memory of those who lost their lives in the Lockerbie air disaster. Crew Manager Andrew Burnett also received an award in recognition of his outstanding commitment and services to driver training within Dumfries and Galloway, while the Dumfries-based Community Action Team were recognised for their outstanding commitment and community safety achievements over the last year. Individual community fire stations across the region were also awarded for their achievements in 2018. This included: Sanquhar Station, for their outstanding commitment to community engagement; Thornhill Station, for their outstanding commitment and resilience in delivering services; Kirkcudbright Station, for their outstanding level of appliance availability; and Lockerbie Station, as the best performing station during last year’s Operational Assurance Audit Programm. The Dumfries and Galloway area was also recognised for its incredible fundraising efforts over recent years, having raised more than £18,000 for the SFRS Family Support Trust. All 17 Fire stations across the region have made significant contributions to annual charity challenges, including ‘Le tour de D&G’ in 2017 and last year’s ‘D&G 3 Peaks Challenge.